Two divestment activist groups organized on Harvard’s campus last week — one calling on the University to end its investment in farmland holdings, and the other seeking to cut Harvard’s financial ties to companies connected to the United States prison system. Roughly 30 students gathered in front of the Smith Campus Center and Massachusetts Hall — which houses Harvard’s central administration — on Friday to urge University President Lawrence S. Bacow to divest the University’s $39.2 billion endowment from farmland holdings around the world. The rally was organized by students in groups including the Harvard Democrats, Native Americans at Harvard College, and Harvard Undergraduates for Environmental Justice — an organization affiliated with the Divest Harvard campaign. A September 2018 report detailed the web of companies through which Harvard Management Company, the University’s investment arm, invests in farmland from California to Brazil. The 16-page document included accounts from those who said they were unfairly pushed off of land that Harvard now owns, or who said they have suffered health problems from Harvard-linked farms nearby. Organizer and College student Ilana D. Cohen ’22 read from a list of demands put together by Divest Harvard — a student group committed to divesting Harvard from fossil fuels — which was eventually delivered to Mass. Hall. “We call upon the University and the Harvard Corporation to take responsibility for the human and environmental rights violations stemming from their investment practices, as well as support a comprehensive independent investigation into these practices and to abide by their own code of investments moving forward,” the demands read. The Harvard Corporation — the University’s highest governing body — has played a roll in previous Harvard divestments, including its financial separation from tobacco companies in 1990. Harvard Management Company spokesperson Patrick McKiernan wrote in an emailed statement that Harvard’s investors work on initiatives to “ensure” that they “can leave the land and community better” than when investment were first made, and have worked to “reposition” their portfolio in recent years. Rally participants sang songs and carried posters emblazoned with slogans like “This Is Not A Favor, Hands Off The Land,” as they listened to speakers describe their concerns with Harvard’s investment in these holdings. “The reason that we feel it’s really, really important that students, the community, and really the wider world know about Harvard’s investments in this land is because we’re asking Harvard to abide by the principles that they have set out to be a responsible investor, which includes respecting human rights and includes respecting the environment,” Flores-Jones said. University spokespeople did not respond to multiple requests for comment about these statements. 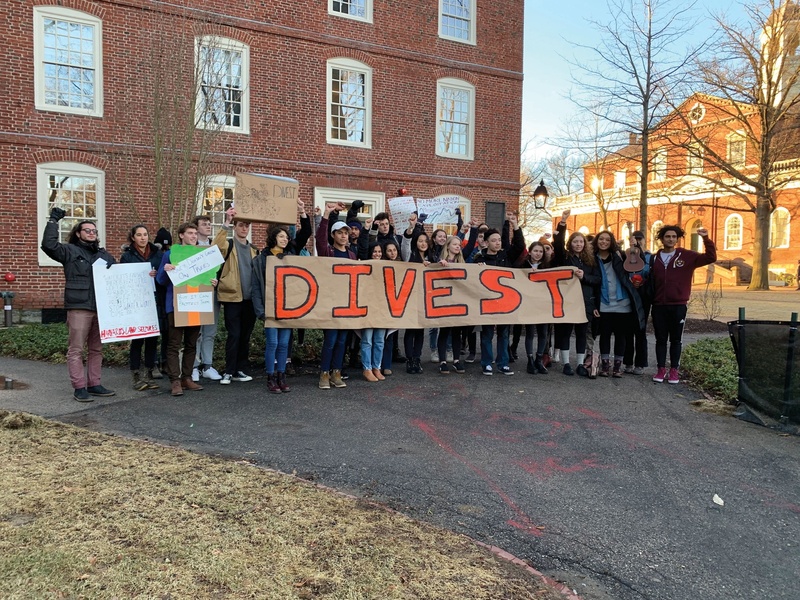 Farmlands, however, were not the only target of divestment activism at Harvard last week. The Harvard Prison Divestment Campaign released a petition last Monday calling on the University to withdraw its investments from companies tied to the prison industry. As of Monday afternoon, the petition had garnered 1,081 signatures. The petition, which lists several demands for Bacow, asks the University to “divest Harvard’s holdings from companies that profit from the prison-industrial complex” and invest instead in “communities disproportionately affected by mass incarceration.” The activists also called on Harvard to disclose all of its endowment holdings and specify any stake Harvard may have in companies that profit from the prison industry. Business and Law School student Amber A. James ’11, an organizer for the Harvard Prison Divestment Campaign, said Harvard affiliates should be made aware of the University’s investments in companies with connections to the prison industry. “Harvard students have a right to know but also to not be associated with an institution that is supporting the prison industrial complex, which is responsible for caging millions of people, surveilling millions more people, inflicting violence, harm, and oppression on people of color, on low income people, and communities from which they come,” James said. An Undergraduate Council ballot referendum last year urging for divestment from the “prison-industrial complex” garnered 77.2 percent of the vote. Asked in October whether Harvard would consider divesting from prisons, Bacow repeated the longstanding position of his predecessors: The endowment is not the appropriate mechanism to effect social change. In an emailed statement, University spokesperson Jonathan Swain reiterated Bacow’s previous statement. “There are other ways the University works to influence public policy, including through scholarship and research,” Swain wrote.